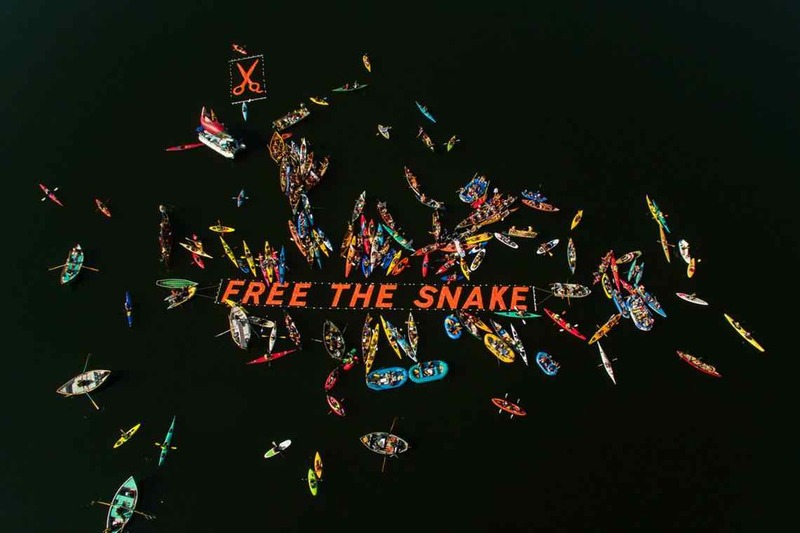 Organizers of the Oct. 3 "Free the Snake" protest targeting the Snake River system of dams say Saturday's demonstration exceeded their expectations. "People came together today to give a voice to what is perhaps the greatest tragedy occurring right now in the United States regarding native species," said Brett Haverstick, education and outreach director for Friends of the Clearwater and one of the event's organizers. "Today's actions are no doubt sending a ripple across the country and to the White House." Officials with Idaho Rivers United say they counted more than 300 paddlers on the lower Snake near the lower Granite Dam, all protesting what they said are the threats posed by the dams to natural salmon migration. This year, only 45 sockeye salmon survived the 900-mile journey from the ocean to Redfish Lake in Idaho, due to high water temperatures. "It's amazing to see citizens from throughout the Northwest and across America come together and give a voice to the lower Snake River, which has been silenced for nearly a generation," said IRU Conservation Director Kevin Lewis. "Idaho's iconic wild salmon and steelhead need that voice to return to the abundance of the pre-dam era." Participants put their kayaks into the Snake on the north bank of Lower Granite Lake and paddled downstream to the Lower Granite Dam where Saturday's rally was held.